Errigal Plant & Sales Ltd boast a wide range of plant and services to meet their customer’s needs. Operations Manager Keith Gladney tells us customer service and value are integral to their business, along with the quality of the equipment they offer. Having trouble getting finance for the equipment you desire? Errigal Plant & Sales Ltd can help. They understand how frustrating financial institutions can be towards new company start ups and people who have judgements/defaults on their credit files when it comes to purchasing equipment. In response, they have designed numerous packages whereby they purchase the equipment and lease it to their customers at affordable terms with outright ownership at the end if desired. From their base in Ballygawley, Co Tyrone , Errigal Plant and Sales Ltd are able to cover north and south and the progressive company aims to become recognised as the leading plant leasing and rental provider on the island. Approaching two years in business, having only been established in May 2014, the early signs have been promising for the ambitious company. The long hours spent getting the business up and running have proven to be worthwhile... and they are not finished yet. 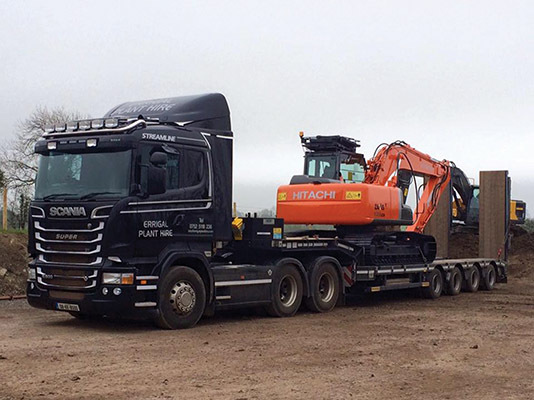 Errigal Plant and Sales Ltd are constantly adding to their fleet to provide their customers with the most comprehensive range of plant machinery and vehicles to hire. For instance, they recently took delivery of a new 4 axle Faymonville Low Loader bedecked in the company's flagship black colour. All their plant is constantly updated to keep up with the ever-changing demands and safety requirements of the construction industry. In addition to allowing for greater productivity, this is backed up by high level of service and attention to detail that they pride themselves on. Put simply, you can you can trust them to deliver the highest quality machinery and best level of services available. Not to mention the fact that their equipment is priced very sensibly affording their customers a cost-effective hire or leasing solution with value added services. “Our aim is to supply the best equipment that is out there and we have that at the minute,” Keith added, “and we offer unbelievable rates on Rent to Buy at the minute for the gear we supply. A recovering construction sector sowed the seeds for the setting up of the burgeoning business and it has very much been a case of so far, so good. They've come a long way in a short pace of time but have no intention of resting on their laurels. “The whole thing is picking up, we seem to have turned a corner but, let's be honest, it couldn't have got any worse! The key for us is to keep our gear new and fresh to allow us offer good products at reasonable rates. Supplying a prompt, reliable and helpful service at all times, Errigal Plant & Sales are confident that the quality of their equipment and standard of service is second to none. Their plant machinery is extensive and ideal for both commercial and domestic projects. If you want to learn more about Errigal Plant & Sales Ltd, get in touch and speak to their sales staff who will be happy to help in any way they can.